Having had such success with the original “4 Degree Map” that the United Kingdom launched last October, my colleagues in the UK Foreign and Commonwealth Office have been working on a Google Earth version, which users can now download from the Foreign Office website. 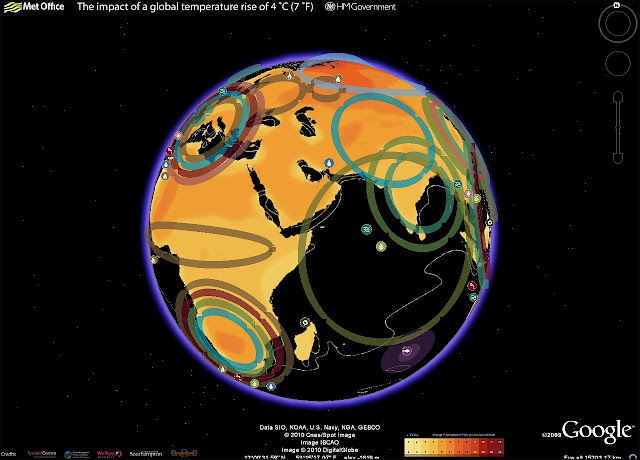 This interactive map shows some of the possible impacts of a global temperature rise of 4 degrees Celsius (7° F). It underlines why the UK government and other countries believe we must keep global warming to below 2 degrees Celsius, compared to pre-industrial times; beyond that, the impacts will be increasingly disruptive to our global prosperity and security. In my role as the UK’s Climate and Energy Security Envoy I have spoken to many colleagues in the international defense and security community about the threat climate change poses to our security. We need to understand how the impacts, as described in this map, will interact with other drivers of instability and global trends. Once we have this understanding we can then plan what needs to be done to mitigate the risks. The map includes videos from the contributing scientists, who are led by the Met Office Hadley Centre. For example, if you click on the impact icon showing an increase in extreme weather events in the Gulf of Mexico region, up pops a video clip of the contributing scientist Dr Joanne Camp, talking about her research. It also includes examples of what the UK Foreign and Commonwealth Office and British Council are doing to increase people’s awareness of the risks climate change poses to our national security and prosperity, thus illustrating the FCO’s ongoing work on climate change and the low-carbon transition. Rear Admiral Neil Morisetti is the United Kingdom’s Climate and Energy Security Envoy. Climate change was not even discussed at the G20 last month. It was not even brought up over beer and seal flippers. Thus climate is clearly not of concern anymore for any government. Besides, Britain is broke pal, money for climate crap is off the table. I’d say you had better start looking for a new job. It appears Britain just laid off the last of their carbon traders. I guess there isn't a market for carbon credits after all. So, what is the World Banking Conglomerate's/One World Order's next scheme for lining their pockets while redistributing wealth? The financial crisis, budget cuts, and changes in government obviously raise questions about commitment and resources for addressing climate change. But I think the advantages of the Hadley Centre 4 degree map and the new Google Earth version of it are quite different things. They make more specific and visible the expected impacts of 4 degree warming. So much of the challenge in fostering strong response is in communication of risks and impacts. These tools are advances in that regard given their accessibility especially. The fact that the UK has a serving Rear Admiral, double hatted with MOD and FCO, as climate and energy security envoy is something not many countries can claim. It is significant both for the seniority of the serving officer and for the ability of MOD and FCO to work together. We in the United States do have some leaders still in uniform (as opposed to a fair number of retired officers) exhibiting leadership on this issue – RADM David Titley, the oceanographer of the Navy comes to mind for one. Their involvement is not going to "solve" the climate challenge as they are first and foremost on what climate means for security actors, not directly solving the climate challenges. But they are welcome voices bringing sophisticated risk analysis tools to bear, highlighting some of the wider climate challenges for societies. And in places like the UK and the United States where they are commonly viewed as trusted voices, their flagging those climate challenges should be beneficial. This 4 degree map is a great tool to actually visualize the impacts of climate change. How do we use this to start change? Also, what about the question of how much of this climate change is simply earth's natural cycle? Chloe, to prevent a 4 degree world becoming a reality, countries need to understand the risks from climate change to their national prosperity and security. You can help do this by encouraging others to use the Google Earth map to explore themselves what the impact of failing to limit our carbon emissions could be. At the same time, you can work to ensure that within your organization/chain of command action is being taken to reduce CO2 emissions through energy efficiency and use of alternatives to fossil fuels. Many factors contribute to climate change including both natural and human activity. However, since the Industrial Revolution, additional greenhouse gases have had about ten times the effect on climate as changes in the Sun's output. Most of the climate change that is shown on this map is the result of greenhouse gas emissions, with only very small contributions from natural changes, such as changes in solar output. We know this because if we run the models again, but take out the effect of greenhouse gases on the atmosphere, we no longer see the kind of temperature rises shown here. Here is an interesting question. Carbon emissions have been in the spot light of most industrialized countries, and most are taking steps (even if they are somewhat inadequate) to mitigate their carbon emissions. However, my concern is with the industrializing countries. These countries are trying to stimulate their economies and make a better life for their citizens but are getting pressure to clean up their act. It is easy to point fingers and tell them they need to stop, but what right do we have to do that? Most of the countries that are pushing for stricter controls of carbon emissions had the advantage of industrializing during the 18th and 19th centuries when there were not sanctions of pollution. These countries now have the money to convert to green energy and are less concerned with simply providing simple amenities that the less developed countries are not trying to attain. I’m not saying that it’s ok to pollute. I’m just saying it’s not really fair to tell a country they shouldn’t provide their people electricity because the only way they can afford it is via coal fed power plants. its unfortunate that we have to find ourselves in these situation, for i believe that it was the same issue that gave rise to the extintion of the dinusads age.